On July 1st, Stampin' Up! introduced a new line of product called Decor Elements. 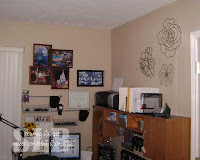 It's really an extension of the Definitely Decorative stamp line which features large stamps for stamping on walls. The Decor Elements are laser cut images that you can apply to your walls. The beauty part is, when you are tired of them you just take them off!! No repainting involved. I've been waiting to talk about these on my blog until I had time to play with them and get them up in my own home. I don't like to recommend products until I've tested them and I have to say, I love these things! I put some up in my living room and it was the element I needed to put a wall to gether of my vacation photos. Life Is Good says it all when I view my photos from places I've been. Stampin' Up! must have read my mind when they decided to use that phrase. Here's my living room wall, all decked out! Once I got that project done, I had a couple more in mind for the stamp studio which I've been hard at work on this past month. I'm almost done, just a few touches here and there but here's a peek at part of it. Of course, I had to use the Create definition in my work space, how could I not? I had a vision but I was the only one who could see it. When my dear husband was helping me, he just couldn't understand what I wanted but once it was all together he exclaimed, "wow, your area look great and so professional!" Just th e words I wanted to hear and I knew I had acheived my goal. You can see that the studio is coming along nicely. I have my tables and chairs in and my shelves. I'm still moving into everything but it's getting there. Tomorrow if my first big event here, so we'll see how it all works out. To the right is a close-up of my create wall. One more picture to share before I move on and start working once again. I had some photos of me and the family at Walt Disney World. Photos that I really loved for one reason or another. I enlarged them to 8x10's and put them in a nifty collage frame. When I look at them they just make me happy. 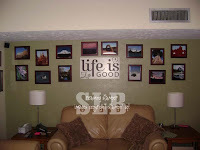 I decided that the Happiness decor element needed a spot on the wall next to these photos. You'll also see I played with the Manhattan flowers and the flourishes as well. I hope my pictures give you some ideas for how you can use the Decor Elements line in your home. For those of you coming to my open houses this weekend, you'll see them in person. Pictures really don't do them justice! I'll be back later with Quick Card Thursday! I love the way you used the new decor elements in your home. I can't wait to see them in person! 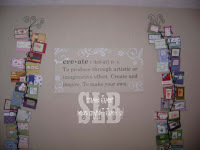 I love the create wall with all the cards surrounding! It looks very neat and inviting!! !